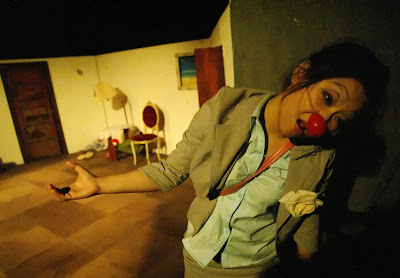 A political metaphoric performance presented by the most promisisng force of theatre in 2008. George Orwell's scathing destruction of the dictatorial governance of Communism, "Animal Farm" was written in 1945. Yet, what is its relevance today? In 2008, Pentas Project will boldly question the complications of power and greed, capita;ising upon the boiling discontentment of the people and the strange political and social phenomena which is real life for many. This is a shattering story of totalitarianism, desire, grees and corruption - forcing you to face the actual collective consciousness of the worst of human weaknesses. Supported by KLPac + HSBC in the Arts + Colorganda! "...each director ...succeeds in delivering something resonant, relevant and powerful.,,, a remarkable evening, displaying the vibrant diversity of the KL theatre scene" -- The Flying Inkspot, Singapore. Pentas Theatre Collaboration Project is a platform of interaction within different cultures and realms and encourages diversities and possibilities in theatre arts and theatre language. 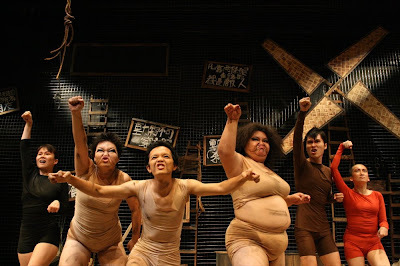 A collaboration based on the theme of LANGUAGE, was between three Malaysian theatre company, Pentas Project Theatre Production, The Instants Cafe Theatre Company and The Alternative Stage. Premiered in 2006 in Kuala Lumpur, it went on its international tour to Japan and Singapore in 2008. Now we are back in KL. "Silence, please works beautifully with its oblique, sophisticated approach to contemporary theatre; five actors move in a combination of naturalistic and abstract movements as a brilliantly performed English-language voiceover describe a Hindu family's experience og their mother's death. Poetic, moving, and politically resonant too-splendid." - Fying Inspot Singapore. 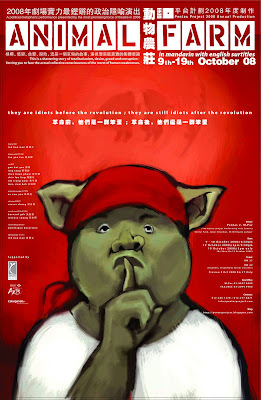 "Features a madcap series of scenes where four Chinese-language actors re-enact the interrogation of language; they mimic own monologues and movements as pre-recorded video of their improvisation plays in the background, then re-enact interview with a range of mandarin, Cantonese, Hokkien and Hakka-speaking citizens; then there's the P.Ramlee movie... Coming after a piece about silence, this piece is instead about noise, language as noise, politics as noise, performance as noise, noise that is glorious, chaotic and alive... hilarious" Flying Inkspot Singapore. Supported by : HSBC in the arts / ASTRO / Colorganda! 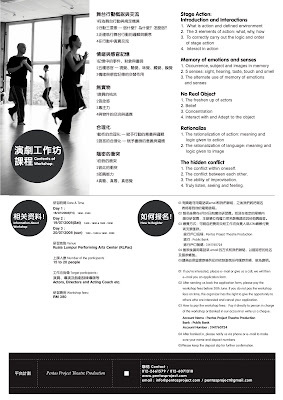 Before conducting a 4 days workshop, Ma Chao Chi will do a 20 minutes demonstration performance using techniques she learnt from the Lecoq School. This demonstration performance is excerpted from her full length one woman play "Dinner for one". She will also be there for a brief artist talk after the performance. Dinner for one is a clown-solo played by an actor. The story speaks of one woman who lives alone, and who in spite of her loneliness and monotonous life, is always looking for love. We see how she spends her everyday life in a very small and dull room. With the unwinding of the actions - her joy, her loneliness, her fear, and her dream are manifested. The workshop will emphasize the basic techniques of the Lecoq School, and also highlight the relationship between the performing body, space, time, rhythm as well as the play itself. The contents include non-verbal improvisation practice, analyzing movement, Masque Neutre and more. Analyzing Movement : We will explore the rules of man's movement through imitating and analyzing movement in our daily lives. The analyzing of movement also includes mime, gymnatics, theatre games and fighting movements. Through all these practices, we will be able to look into the coordination of the body and also the most important element of performing - the 'game'. Improvisation Practice : Includes non-verbal improvisation practice, performing and rhythm, relationship with space , imagination and performing tactics practice, colour, words, music and substance. Masque Neutre : Masque Neutre is a mask without facial gestures. It represents physical and mental conditions that are totally balanced and coordinated. Under Masque Neutre, the actor must abandon all the physical and mental habits of oneself, and return to the most natural self, as if a piece of white paper. Exploring the Genres : We will explore the following genres of drama through the condition of pushing and pulling, that is, Melodrama, Tragedy and Commedia dell' Arte. Special Topic on Movement : Through the practice of physical movement, experiencing the balanced and unbalanced condition of the body, the conditional of the body in relation to direction and space, the direct and pure reflection of strength, eventually connecting the inner situation with physical movement. Independent Creativity : The Participants will be divided into a few groups without the influence of the instructor. Participants will be given a topic and will need to rehearse and finally present it in class. Actors, Directors and Acting Coaches etc. 2. Please complete the application form and e-mail it back to us. The workshop fees must be paid before 30th AUGUST. If payment is not received in time, the organizer has the right to cancel your application. Ms Ma Chao Chi is a famous theatre director, actress and theatre teacher from Taiwan. She is also a Professor at the National Taiwan University of Arts, as well as at the Taipei National University of Arts. 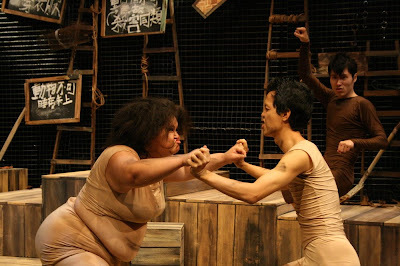 After completing her studies in Humanity and Economy at the National Taiwan University, Ms. Ma decided to take-up professional theatre study (an Educational Theatre program ) at New York University. She then went on to study at the International School of Theatre Jacques Lecoq in Paris where she learned Mime, Acrobatics, Masks, Clown, and physical theatre. She translated the book ' Le Corps Peotique' by Mr Jacque Lecoq from French to chinese, published in 2005 by Laurel Publishing Company, Taiwan. Jacques Lecoq (December 15, 1921 ~ January 19, 1999) was a French actor, mime and acting instructor. Born in Paris, he is most famous for his methods on physical theatre, movement and mime taught at IEcole Internationale de Theatre Jacques Lecoq from 1956 until his death in 1999. Lecoq began his career by studying physical education and sport. after teaching this subject for several years, he found himself acting and a member of the Comediens de Grenoble. This company and his work with Commedia dell'arte in Italy (where he lived for eight years) introduced him to ideas surrounding mime, masks and the physicality of performance. An introduction to Makhampom's intercultural physical performance style through a group devised process. 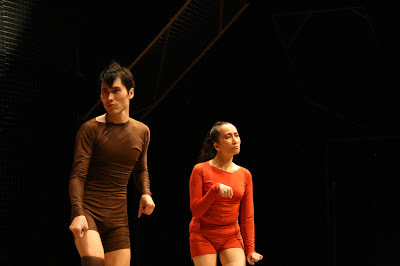 Through a series of Makhampom's physical theatre games and warm-up, participants will develop a collection of body shapes that, through group process, will be the basis of creating short performance. "Theatre for youth development workshop"
The Makhampom Theatre Group began working in 1980, applying theatre process for community cultural development. In conducting a dual program of production-oriented development work, Makhampom has developed an extensive toolkit of activities that it now applies in various contexts. Makhampom currently had four streams-performance, Community, Education and International Programs - through which the theatre praxis is applied. This workshop will introduce several of the performance, educational and community-based approaches of Makhampom through an integrated, participatory workshop. This will include activities designed for young people in addressing localizaed themes and issues through theatre based execises, followed by series of group-based theatre-devising process. The exercises will include theatre games, social mapping, physical storytelling, and experiential body-based devising work. At the completion of the workshop the participants will also prepare a showcase of performance material deriving from the workshop. 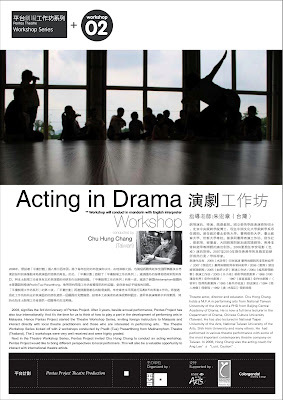 This workshop is good for theatre workers and educators applying theatre in the dual function of product and process. The facilitator will take you through a series of workshop exercises as an experience in Makhampom's theatre approach. is Makhampom's secretary general and most senior member, joining Makhampom in 1982. For over a decade he has been director and visionary of the group. He is renowned for his work in the fusion of traditional and contemporary theatre styles and was recently awarded by the Ministry of Culture as Thailand's leading national contemporary performing artist. He is trained in classical and contemporary performance and applies these skills together with his TCCD experience, as facilitator, director, dancer, actor and dramaturge. He has recently returned from fellowship in USA and is involved in several international collaborations. 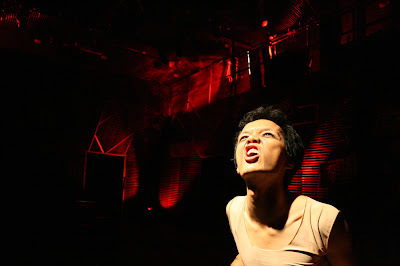 A bi- annual theatre project in Malaysia, Pentas Theatre Collaboration Project is a platform of interaction within different cultures and realms and encourages diversities and possibilities in theatre arts and theatre language. 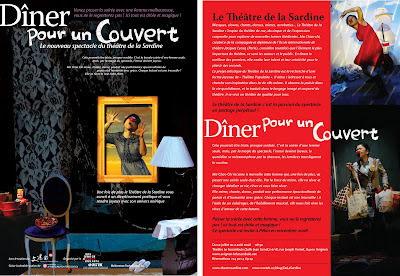 Three theatre directors are invited to participate and a common theme is decided by mutual agreement. The directors then create their individual pieces based on the discussions and the three pieces are then presented in the same evening. 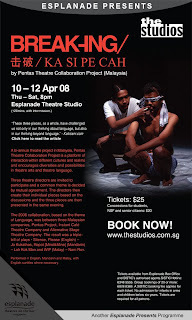 The 2006 collaboration, based on the theme of Language, was between three Malaysian companies, Pentas Project Theatre Production, The Instant Cafe Theatre Company, and Alternative Stage Theatre Company. 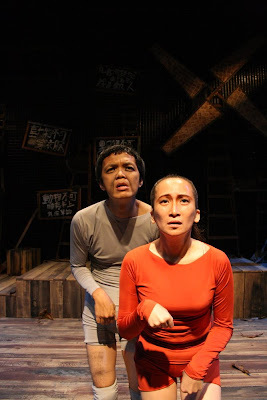 The result was a triple-bill of plays -Silence, Please (English) directed by Jo Kukathas, Repot [Mind+Mine] (Mandarin) directed by Loh Kok Man and WIP (Malay) directed by Nam Ron. 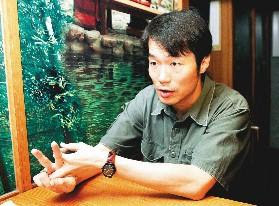 BREAK-ING / 击破 (ji po) / Ka Si Pe Cah had stage in Tokyo in Feb 2008 before playing at The Studios season. In English, Mandarin, Cantonese, Hakka, Hokkien and Malay, with English subtitles where necessary.